This Spring Powered air rifle kit is ideal for those looking for a beginner's air rifle to get into the great sport of shooting and the Stinger UL air rifle is one of the best to start off with. The Underlever action is simple and easy to use, and benefits from a fixed barrel system which ensures there is no movement in the barrel whatsoever to increase accuracy and consistency. The pellets are loaded directly into the barrel after the lever is cocked which helps to prevent any lost air when the rifle is fired, as can be seen on a standard break barrel. The stock is a custom model which features a dark stain and deep checkering to the forestock and pistol grip to give a look and feel of quality and class. The metalwork is finished in a deep gun blue which competes with even the finest of rifle today, and the rifle comes fitted with open sights as standard. 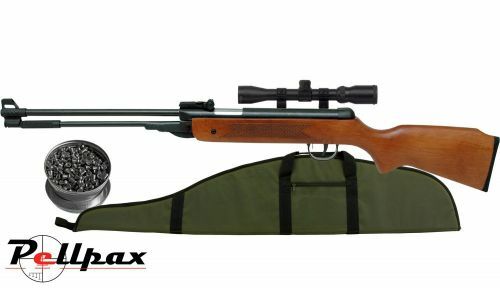 As well as this air rifle, we are including a 4x32 scope with mounts, a fully padded gun bag, and a tin of .22 pellets to get you started. Everything you need to start shooting as soon as it is delivered! Total Length: 103cm / 40.5"
Barrel Length: 44.3cm / 17.5"
Add this item to your basket & spend an extra £360.01 to apply for finance.